Yaw...have you ever try this one ? 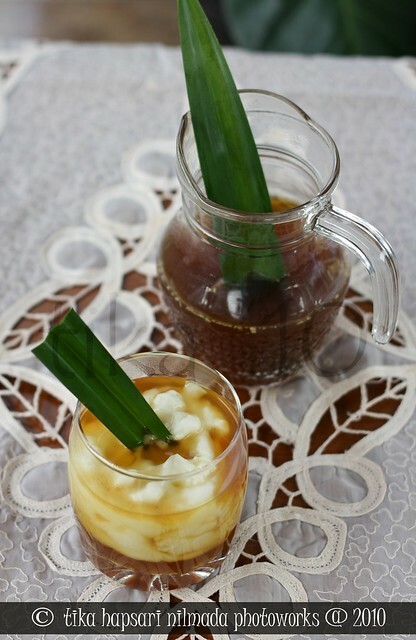 A traditional Indonesian dessert, made from rice flour and coconut milk with palm sugar syrup. Trust me, it's a must try ! But if I don't have time to make this, I can find the seller easily right in front of my house, every morning. Ohhh...lucky me, living in this beautiful country with many delicious foods (ssshhh...don't mention about the corruption in our government, shameful and my blog is also forbidden for politics !). Okay everyone, don't hesitate to make this pudding, the one you'll never regret ! 1. Pudding : mix all ingredients in a saucepan. Bring to boil. Don't forget, keep stirring the mixture and boil until the mixture become thicken like thick cream. Remove from the heat. Set aside. 2. Syrup : combine all ingredients and bring to a boil. Stir well until palm/coconut sugar dissolved. Remove from the heat. Sieve the syrup and keep aside. 3. Serve : ladle the pudding mixture into glass then pour the syrup on top. 1. Bubur : Campur semua bahan jadi satu, harus benar2 licin supaya nanti tidak menggumpal2, lalu masak diatas api sedang sambil diaduk hingga mendidih dan meletup-letup. 2. Saus : masak semua bahan hingga gula larut, lalu saring. 3. Hidangkan : sendokan bubur ke gelas lalu tuangkan saus. To read behind the scene story click here. This Javanese version of rice pudding is one of my faves. Are you using palm sugar or coconut sugar? 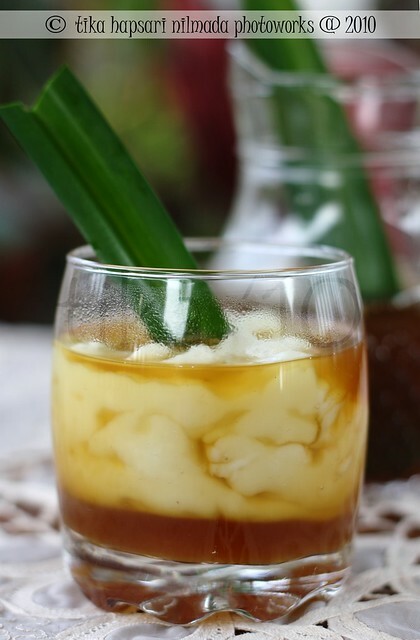 this is one of my favorite indonesian desserts, Mbak Tika! :) i want some!